Your website is elaborate and beautiful in its functional design. You have a steady list of customers who have signed up for email alerts from your business. Your marketing efforts are pretty set and ready to grow, right? Unfortunately, if you are skipping out on social media marketing, you are potentially walling off a whole sector of consumers and clients that spend most of their internet time on social media. If you really want to build your small business into an income-generating empire that has the ability to reach the masses and feed them enticing information, social media is the way to go. You may think that sticking your foot into the social media marketing door sounds a little too offbeat compared to your usual marketing strategy, but this is actually the key to seeing major changes. If the whole social media marketing idea is lost on you, there are a few facts that you will find interesting. Social Media gets more attention than anything else online. Period. The average person usually has about five social media accounts that they check regularly, accounting for more than 28 percent of the total time spent online. So even if people don’t check their emails, hit up a shopping site to see what’s on sale, or even try to find a quick answer to a weird question their kid asks, they will almost definitely be on social media at some point in the day. The key to consumer marketing is to be visible in the right places, and social media is almost guaranteed to be one of these places where you will at least catch a customer in passing. Social Media isn’t just for young people. 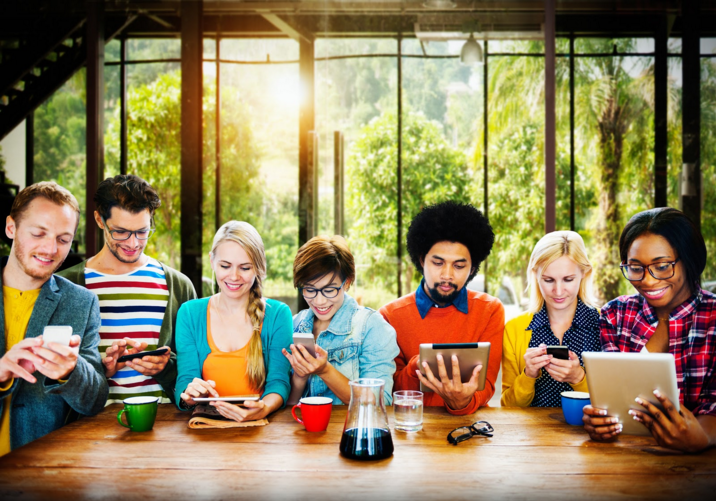 When you picture customers fiddling away on social media, scrolling through the feeds and checking in with their friends, you may conjure up an image of a fairly young sector of people. But, about 48 percent of internet users over the age of 65 do have at least a Facebook account, and many have other sites they frequent, such as LinkedIn and Twitter. Therefore, when you market on social media, you are actually marketing to an incredibly diverse crowd of probably every age group. This is good to know if you operate an age-specific business, such as something associated with medical supplies or senior living, but is just as helpful if your business needs to market to all ages. Develop your buyer personas to better reach different age groups on Facebook. Something popular on Social Media will not go unnoticed. As a society, we are social creatures and we all enjoy finding ideas and interests that we have in common with other people. This is why social media marketing is such an effective tool for small business owners looking to grow the size of their brand and reputation. One person sees what you have to offer, they like your page or share it with their 300 friends. These friends then follow the same patterns, and before you know it, one simple post about a specific product or business event has spread like wildfire all over the pages of a site, very hard to ignore and definitely leading to interest in your business. Social Media is not a short term strategy. Social media users are driven by instant validation through likes and comments — the more one can get, the better they feel. However, the same can’t be said for a business page. It’s slow to get your followers engaged and you often need to pay a little to get the ball rolling. Staying consistent in your social media outreach strategy is key. Even if you just like or comment on a potential customer’s post a couple times a day with the intention of starting a conversation is better than just pushing up content. Likes are more valuable than you would think because it’s like a little wink to capture the attention of a potential customer. It’s also helpful for developing a relationship with your customers. Showing a little love goes a long way! Don’t shy away from a strong social media presence. It’s a cost-effective and easy channel to manage. There are many tools, like Buffer and Hootsuite, that can automate your posting strategy, leaving you time to make meaningful connections one-on-one. Get in front of more people and have fun with it! (But mind your manners).